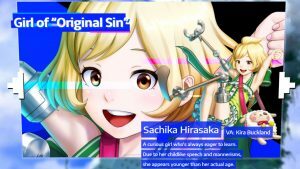 Spike Chunsoft’s Zanki Zero: Last Beginning takes a unique look at the survival RPG genre, by combining a cast of quirky characters that only have 13 days to live on a post-apocalyptic island. But that is just the beginning, as each clone can extend their life, and each time they die they take gained skills from the previous life, into the next. Players will take on battles against what is left of humanity, mutated beings and monsters that now dwell on earth. Using the skills available, it’s up you to improve humanity in this twisted survival of the fittest. Originally released in Japan, Zanki Zero releases internationally for the first time on PS4 and PC in April 2019. A mix of 3D visuals mixed in with some manga art captures the post-apocalyptic world. Set in a world that has been destroyed by humans, and has sunk to the depths of the sea (until yesterday), players take on the infinite lives of 8 clones, where they must survive the lands that hold nothing more than ruins, wreckage from the recent modern civilization. How and why you must relive these lives is a mystery, one that may hold some dark realizations. 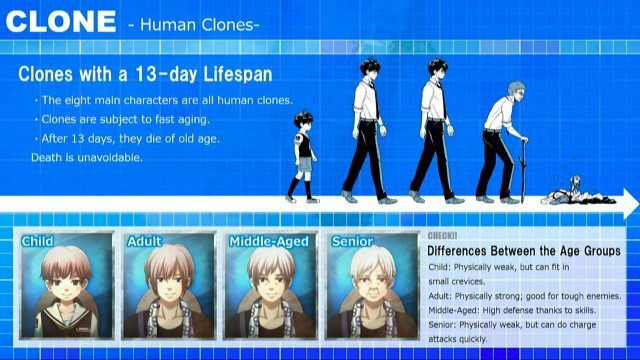 Each clone, although appearing as ordinary human beings, has a short lifespan of only 13 days, during which time they age rapidly before finally dying. After their time on Earth is up, they can use the Extend Machine to be reborn into a new body, prolonging their existence, but doing it through another vessel. How do these clones retain their previous experiences and get input into a new model? Simply through the wonders of hardware known as X Keys. Acting potentially as implants that are affixed to the clone’s stomach, they can continue to live out their lives in a new body. Players must improve base camps, fend of the horrific monsters, hunt for food, battle dungeons and survive until that clones life is spent. What could possibly go wrong? The story is told from the point of view of eight different characters which helps piece together the narrative of the game. 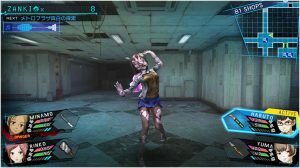 Bringing a very unusual mechanic to the survival RPG genre, Zanki Zero: Last Beginning is a single-player dungeon crawler that has your normal: hunting, monster battling, eating, sleeping and using the bathroom, all of which effect the survival of your party. But where it gets its twist, is with its 13 day life cycle. Each day will effect your stats and abilities from the beginning of your character’s life, right up until death. How you die will also determine what bonuses and upgrades you carry on to your next life. 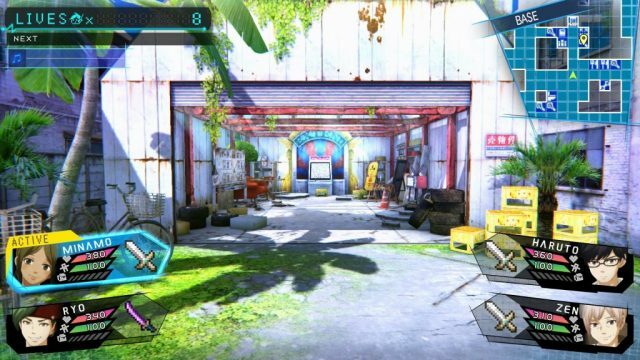 Zanki Zero is a non-stop survival game, meaning the world will continue to progress even if you don’t take actions. It’s important for the player to make sure their character is safe before resting in a spot or taking the time to organize inventory. It will be up to you to help improve living conditions by upgrading buildings and facilities. Players will need to use their wits to fight against the many monsters that now inhabit the world. 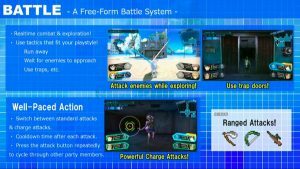 Zanki Zero features team-based combat where you choose characters to activate and proceed to attack targets (aiming at certain parts can even disable your enemy). Holding down the attack button will grant you with a Charge Attack, and it unleashes a Chain Attack involving multiple characters, but will also deplete your Stamina. Killing monsters will gain you points, food, experience and materials, all of which are necessary for your survival. Weapons include melee as well as ranged options, or you can also use traps and wait for the your enemies to come to you. Players will gain score points that can be earned by exploring ruins, and these can be put towards the Extend Machine in order to create a new body. While the new vessel will be reborn, all the previous memories, personality traits, knowledge and accumulated skills from the previous life will carry over. Each upgrade comes with a new benefit. You’ve heard of the phrase “what doesn’t kill makes you stronger”? Well scratch that idea, as dying actually increases your survival chances in the next life. Through the Shigabane System, clones will gain resistances to previous causes of death acting as a bonus, each time making the next generation stronger than the last. A good example of this is if the clone gets mauled to death by a wild animal, their next body will have a higher resistance to damage dealt by animals. While it isn’t easy to determine direct bonuses for all causes of death, for example dying from stress (yes that can happen) will result in an unrelated Shigabane bonus. 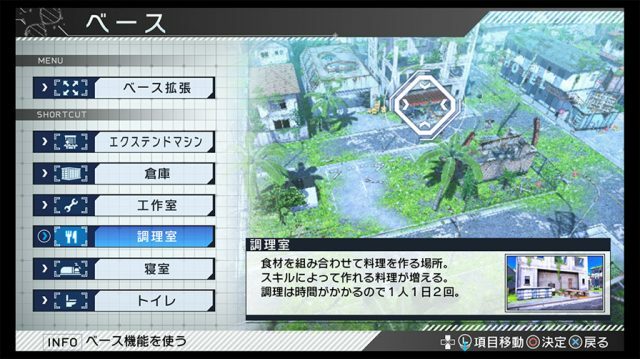 An important part of Zanki Zero is using your skills to survive, skill points are earned by leveling up. Each skill will vary from character to character, however they fall in generally into three basic categories: Battle, Exploration and Crafting. Some skills will only remain active during certain growth stages which include: child, adult, middle-aged and senior. Skills can include poison knowledge, paralysis and others. Whatever skills you learn in one life, will transfer to the next, so they wont be lost every time a clone dies. 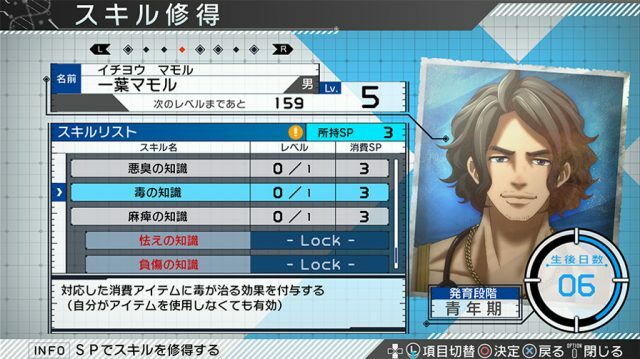 Players will not be able to increase stats by leveling up, as basic stats have already been predetermined according to the character’s growth stage. It will be up to your Shigabane Bonuses and Skills to progress your character. In total there are 8 playable characters, seven are based on the deadly sins. You have the Editor of “Sloth” who hopes to write articles about the truth, has common sense but at times is stubborn. 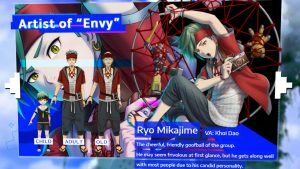 The Artist of “Envy” a the clown of the group but gets along with everyone. 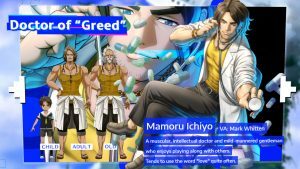 Doctor of “Greed” probably the most intelligent of bunch, gets on well with the group but over uses the word “love”. Farmer of “Wrath” runs a farm in the mountainous regions, has general survival skills but is quite the cynic. The Florist is based on “Lust”, isn’t the smartest in the bunch but has a somewhat cautious nature toward others. The Heiress is based on “Gluttony” sets to inherit wealth from a leader of a large corporation, her personality is difficult to read but she has little care of what others think of her. The Officer holds the sin “Pride”, open-hearted, honest and usually the one who takes care of the group. Lastly, the Girl of “Original Sin” is curious by nature, motivated to learn and acts younger than her actual age but probably her most stand out feature is her bionic arm and leg. 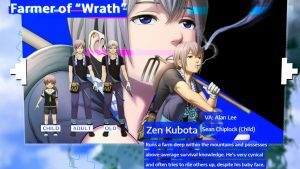 Zanki Zero takes on your typical JRPG look, rounding up a bunch of colorful characters that are not a bad group to look at, combining a mixture of 3D visuals with manga art style. While maybe not the most high-spec graphics, the charming mix could give a refreshing appeal to the survival RPG genre. 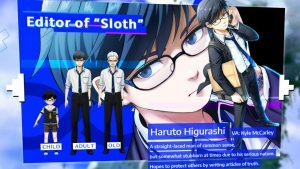 From what snippets of voice acting we hear from the latest trailer released, it looks like Chunsoft have taken the time to pick an array of English voice actors to bring these characters to life. The main theme music played in the opening trailer is a mix of sci-fi other-worldly synths, mixed in with some upbeat jazzy piano. What more could you want from a survival RPG but to feel the ever looming presence of death, knowing that you only have a precious 13 days to progress with your clone. 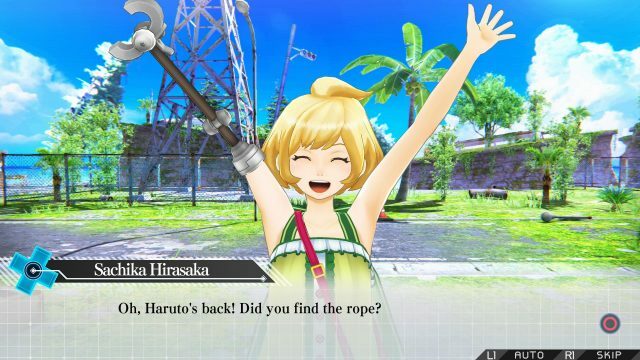 Hopefully Zanki Zero: Last Beginning can give more of a challenge with each rebirth, as gaining bonuses each reincarnations sounds like it may give less of an incentive to keep lesser versions of the clones alive long. Some interesting concepts are in the mix here, shortened life span, quite realistic human life dependent factors, and a mix of characters that sound like they are the worst contestants from a reality tv show since they’re all hoarding deadly sins. 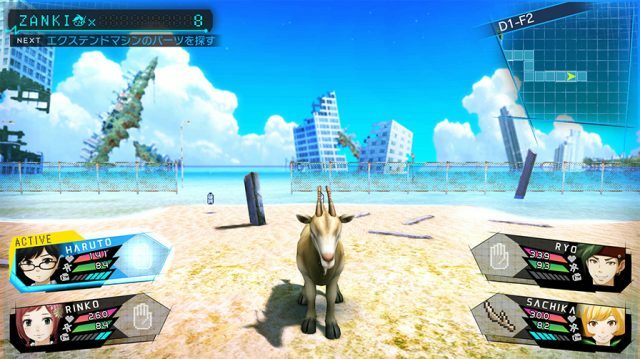 Hopefully Zanki Zero can live up to these unique concepts and offer a survival experience that goes beyond The Sims meets Castaway. Zanki Zero: Last Beginning releases on PS4 and PC on April 9th 2019.